Backstory: ﻿In 2005, artist Matt Furie created the comic series Boy’s Club, which stars the teenage monster characters Pepe, Brett, Andy and Landwolf. In 2008, a comic in which Pepe pulls his pants down to his ankles in order to urinate was popularized on 4chan, along with the expression “Feels good man.” Sad Frog is an illustration of a depressed-looking Pepe used to express feelings of failure or disappointment. Pepe is basically the range of human emotion that we are all capable of feeling. 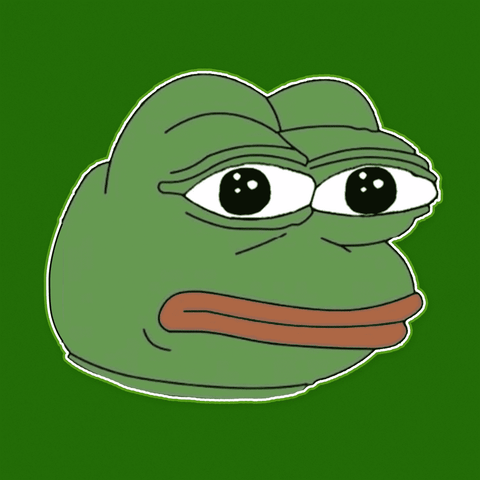 But because the internet does not know sensitivity, Pepe must be the scapegoat (or scrapefrog) through which the internet channels their feelings. 🤩DON’T JUST WEAR THE CELEBRITY, BECOME THE CELEBRITY - He's the meme that feels. He might feels good man, or sad & angry, but at the end of the day he's still Pepe The Frog. Embody the Pepe Mask at Halloween & life.